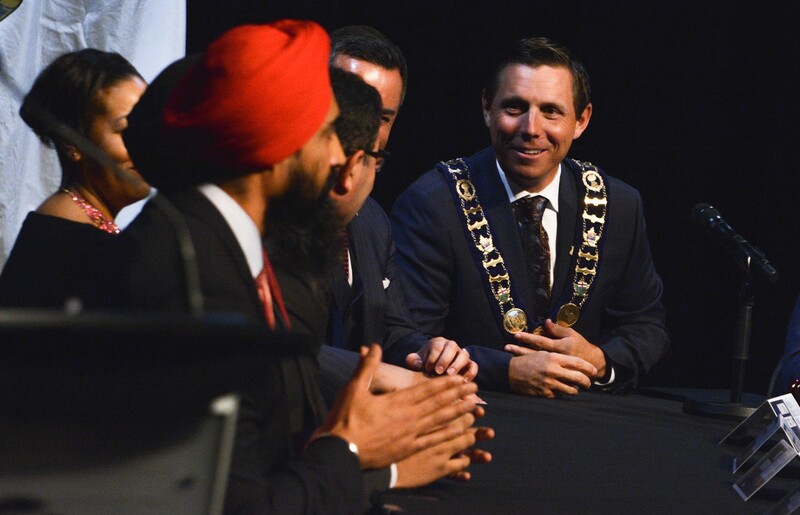 The shake-up of Brampton’s body politic didn’t begin or end on the night of Oct. 22 when Patrick Brown edged out Linda Jeffrey and became the 51st mayor of the ninth largest city in Canada. The calculus included the election of four new councillors — Paul Vicente, Rowena Santos, Charmaine Williams and Harkirat Singh — and a further reshuffling of the deck as Gurpreet Dhillon and Pat Fortini moved up from city to regional councillors. The influx of new talent replaced four retiring councillors — Elaine Moore, Gael Miles, John Sprovieri and Grant Gibson — who collectively left nearly 100 years of public service on the table. In just over four years, council has been completely overhauled, as not one member who served at the beginning of 2014 remains. Council now better reflects a city made up of 74 percent visible minorities, said Brown in his 35-minute address to a near-capacity crowd at the Rose Theatre Monday night. It was a rousing public inauguration that harked back four years to a block of councillors elected in 2014: Michael Palleschi, Jeff Bowman, Pat Fortini, Martin Medeiros, Doug Whillans and Dhillon. That group helped wipe clean a list of names that only a few short years ago ruled the city and included Susan Fennell (mayor), Paul Palleschi (Michael’s father), John Sanderson, John Hutton, Bob Callahan, Sandra Hames and Vicky Dhillon. And there are more changes coming. Tuesday, at the first meeting of the new regime, Santos was chosen as the seventh Brampton member on Peel Region council. She will get a big bump in compensation (well over $50,000 per year, including perks), and sit on council and committees that oversee crucial public services such as water, sewers, roads, social housing, other social services and health. Regional council also has significant sway over planning in Peel and which developers get their way, as elected officials preside over an onslaught of growth projected to occur in Brampton and Caledon over the coming decades. The track record of a now mostly retired complement of regional councillors on growth-related issues over the past few decades is abysmal. Developers, who heavily financed the election campaigns of municipal officials, faced little accountability as they pushed forward plans for sprawling, land-gobbling subdivisions that are now costing all three municipalities dearly. New provincial rules now prevent such corporate donations, but many builders still find ways to influence votes. The situation became so heated during the last term that Caledon councillors, led by Mayor Allan Thompson, walked out of the regional chamber in protest when leaders from Brampton and Mississauga moved to effectively take control of questionable municipal planning decisions by their northern neighbour. Decisions made by Caledon, geographically larger than Toronto but with a population just over 70,000, had prompted legal challenges that presented an unnecessary financial burden to Brampton and Mississauga taxpayers, who were subsidizing much of Caledon’s growth costs due to expensive, poorly planned development. Santos will join a fraught regional dynamic. Another newcomer, Singh, was chosen as the alternate, a position filled by Jeff Bowman last term. Bowman and Williams lost out to Santos in the first vote at Tuesday’s council meeting, which decided who would be elevated to the region. Singh edged Williams out in the second vote to determine the backup. The votes brought to the forefront Brown’s pragmatic style of leadership and his ability to stickhandle through an awkward situation. He played the ultimate arbiter and abstained from voting — not tipping his support to one councillor over another. Firmly in the middle is where his political mentor William Davis felt most comfortable during his long run (1971-85) as premier of the province. Davis is not only Brown’s mentor but threw his support behind him during his run for mayor. He was also at Monday’s emotional kickoff, and both appeared on the giant screen in a pre-event taping at Davis’s home that bestowed on Brown the chain of office. The video elicited another loud ovation. The table is set for more political intrigue on Thursday as regional council selects a new chair to replace Frank Dale, the former longtime Mississauga councillor who retired after a four-year term at the helm of Peel’s government. Political machinations have been going on for weeks in preparation for the vote, and names bandied about include Moore and Miles and perhaps even ex-mayor Jeffrey. Mississauga contenders include recently retired councillor Nando Iannicca, ex-MPP Bob Delaney, and former provincial finance minister Charles Sousa. Twenty-four regional councillors will take their declaration of office Thursday, and the new chair and CEO will sit for the 2018-2022 term. He or she oversees programs and services delivered to the region’s 1.4 million residents. In addition to being the head of council, the chair will serve on the Peel Police Services Board and as a board member of the Peel Housing Corporation, along with various other regional and external boards and committees. Dale succeeded former Caledon mayor Emil Kolb, who chaired the region for a generation, beginning in 1992 and ending with Dale’s victory. Kolb oversaw major changes to the region’s governance model, and it was under his tenure that the region spent $557 million on a 20-year waste management contract and completed a $600-million-plus expansion of water and wastewater infrastructure at plants adjacent to Lake Promenade Park on Lake Ontario. Kolb was also heavily criticized near the end of his tenure for failing to provide proper oversight of Peel police, as the force became mired in controversial issues while failing to reflect the demographic changes in Brampton and Mississauga. While Mississauga comprises a majority of the region's population and holds the dominant number of council seats (12), Brampton is one of the fastest growing cities in Canada (according to the last census) at about 600,000 residents — edging ever closer to Mississauga’s 720,000. Yet it holds only seven seats, two more than the tiny municipality of Caledon. In total, there are 25 members, including the chair, and the three mayors. The total investment in its areas of focus in 2018 will be about $3.1 billion. Mississauga was never a fan of regional government, going back to Hazel McCallion, its Lord Protectorate. The problem arose during its formation in 1974. McCallion saw inefficiencies in the plan and was a constant critic. Why were there city roads and regional roads? Why double-up on staff? Who needs more council meetings? Another tier of government? She wasn’t a big fan of the “gentleman farmers” of Caledon, either. The collection of tiny hamlets was over-served and over-represented. Council was blatantly undemocratic. Furthermore, why should Caledon and Brampton make fiscal and governance decisions that seriously affected the citizens of Mississauga? The independence movement begun by McCallion continues under her successor, Bonnie Crombie. While Brampton looks big enough to go it alone these days, it can’t, because it needs the water and wastewater services located in Mississauga. Paying for either would only retard growth. It’s stuck between two choices, both costly. She believes the best candidate should have a strong personality but not be overbearing, and have the ability to build consensus among three councils and 24 councillors. A good working knowledge of the corridors of Queen's Park wouldn’t hurt, either. She thinks Ford blew it when he didn’t allow the public to vote for its own candidate. The election at large of a regional chair would result in voters selecting the region’s leader based on public service, name recognition, experience, personal characteristics and platform. “A good regional chair should be able to ensure Peel gets its fair share of provincial funding for our many social and health services, which has not been done in the past,” she says. Yesterday’s vote at Brampton council was as dramatic as it was awkward. But ultimately it will have no impact on the power base at the region — it rests squarely in Mississauga. Ford’s announcement in late July “pausing” the first-ever election for the chair’s position (not only in Peel, but in other jurisdictions as well) was interpreted by some as an attack against Brown, another twist of the bully’s knife. Ford replaced him as PC leader, going on to win the premiership in June. That was before Brown published a blistering tell-all memoir titled Takedown that targeted leaders and staffers in the PC party and left the premier and his apparatchiks fuming. 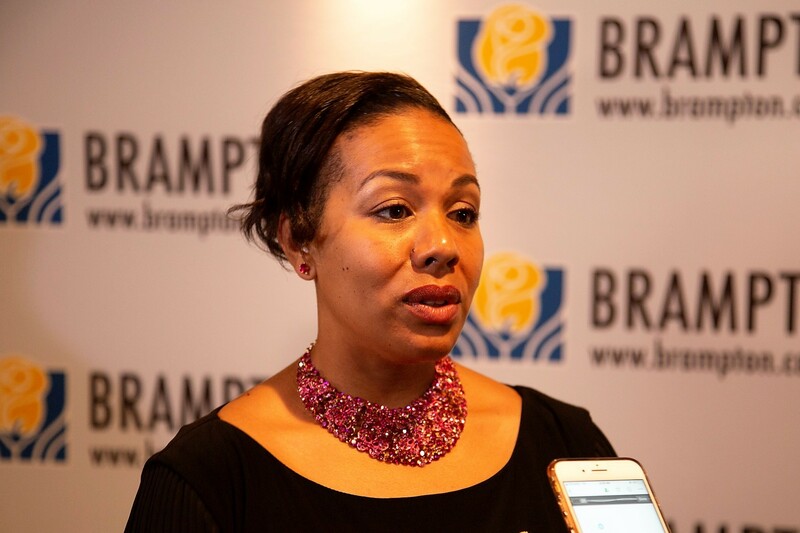 “It’s clear he is not one of my best friends, but this [fair representation] isn’t about us, it’s about Brampton,” Brown said at his press conference. Some think Ford’s enforcement of the status quo — forcing Brown, who had his eyes set on leading Peel, into the political wilderness until he made a last-second decision to run for mayor — was only the aperitif before the real meal: a repudiation of regional government and the eventual creation of super communities, like the City of Peel. Former two-time Wards 3 & 4 regional councillor John Sanderson, who lost his bid to re-enter Brampton council in October, suspects Ford may have a taste for blood after his demolition of Toronto City Council, cutting it in half. He doesn’t think bigger is necessarily better, but does foresee a push to eventually end two-tier government and stop all duplication of services — McCallion’s personal bugaboo. The Tuesday vote to add a sixth regional councillor continued an archaic practice that only breeds division, as Bowman made clear in his five-minute presentation before council. Even in victory, Santos proposed that the city put all city councillors on a rotation that gives them equal access as a regional rep. She put in a motion to ask city staff and the city’s solicitor to change the mix — although the process is complex and still driven by the Municipal Act. Brown stressed a kumbaya approach to running city council during his run-up for mayor, and during Monday’s lovefest he introduced “Team Brampton” to the audience. 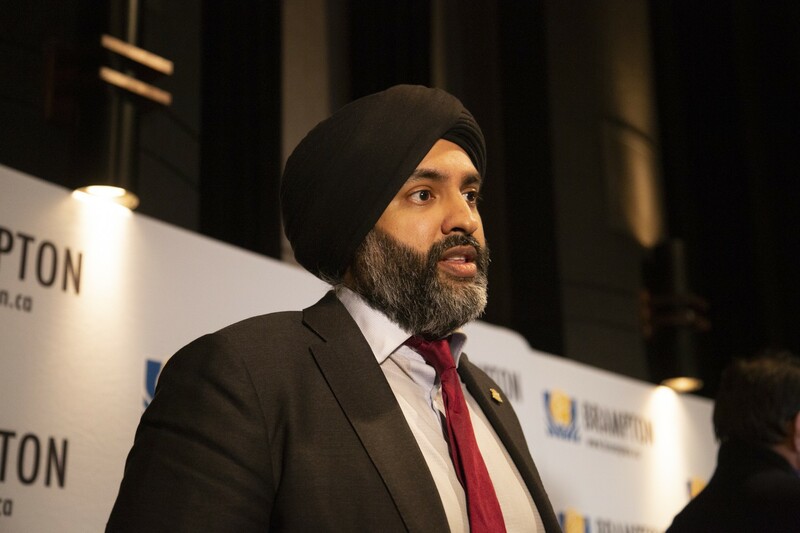 Tuesday’s vote sets the stage for Brampton’s second team to attend regional council, but with a decided disadvantage: the four new councillors — Santos, Dhillon, Vicente, Pat Fortini — and the mayor have never served there before. The divisiveness at the region has a long history, and for Brampton, the willingness of Queen’s Park to give in to the mulish demands of McCallion has knitted the two together. But Brampton is also to blame. It approached the province last year to move two of the Caledon seats to its ledger but never followed through on the initiative. That’s something Brown might want to revisit. Sanderson, who barely lost to Dale in the selection of the Peel chair, says McCallion would never have tried to pull her city out of the region if millions of dollars’ worth of upgrades to water and sewage treatment plants had been invested in north Brampton, not south Mississauga. 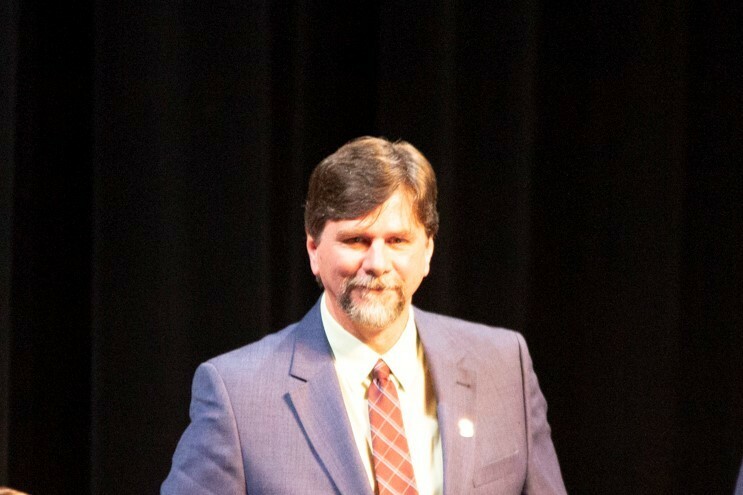 The father of regional government was in the audience Monday night, feted with high praise by Brown. Davis has often said it was he who helped create Mississauga, and in the process McCallion, too. While Mississauga thrived, his hometown fared less well. Now, it’s all about numbers. The population gap between the two cities is narrowing, but the mismatch in regional services only seems to widen. Brown is mystified by the inequities. Brampton taxpayers pay the same as everybody else — they should get their fair share, he said on the campaign trail. Brampton hasn't seen so much political changeover since regional government was introduced in 1974, tying Brampton to Bramalea and tossing in pieces like Huttonville. Brown, who leads with the energy level of a Navy Seal, says a full-throttle approach to attracting new business will be led “through the lens of economic development.” By fixing the fundamentals (cutting red tape) and making taxation levels more competitive, this Brampton can compete with Mississauga or any of its other neighbours — if it gets to do so on a level playing field. Brown told the Rose audience Brampton simply can’t be ignored any longer. Santos says it’s way past time Brampton leveraged its power as Canada’s ninth largest city. The catalyst for change could be the 2019 federal election. Brampton has needs, and there are five seats that need filling. The council was trotted out ceremonially on Monday night, and by Tuesday afternoon, its regional council representation was fixed. So is its makeup. Santos is the first Filipina elected to council, and Williams is its first black woman. There are two Sikhs (Dhillon and Singh), and Fortini was born in Italy. Medeiros is a rock star in the Portuguese community, and the others are born and bred in Brampton. It’s an eclectic mix, but business-focused. Santos holds a Bachelor of Business Administration degree from the Schulich School of Business, and a master’s in sustainable development and environmental planning from the London School of Economics, in the UK. Singh also has an MSc in economics and an MBA from Schulich. Brown will sit on the Peel Region Police Services Board and will have a critical vote ahead in picking a new chief of police, after the retirement next month of Jennifer Evans. He has promised to get more officers to patrol in Brampton, to help cut down on the rash of violent and gun-related crimes that turned this past summer toxic. With healthcare costs on the rise, social housing and poverty constant concerns, a need for more recreational centres and other regional issues coming to the table, Brown and his regional councillors (which also include Palleschi and Medeiros), are eager to see the city’s needs reflected in public policy. Back in 2005, when the furor about Peel Regional Council representation made it to the floor of the Ontario legislature, Superior Court Justice George Adams was hired to assess and resolve disputes that were driving a wedge between the three partners in Peel. He said it was critical the communities got full support from the province. Team Brampton is still waiting.